Our four ingredient beef enchiladas are ready in less than 30 minutes. Stuffed with ground beef, cheese and salsa, these easy enchiladas will become a fuss-free favourite. Brown meat in large skillet. Add half each of the Velveeta and salsa; cook until Velveeta is completely melted and mixture is well blended, stirring occasionally. Spoon scant 1/4 cup meat mixture down centre of each tortilla; roll up. Place, seam-sides down, in single layer in shallow microwaveable dish; top with remaining salsa and Velveeta. Cover with waxed paper. Microwave on HIGH 4 to 5 min. or until enchiladas are heated through and Velveeta is melted. 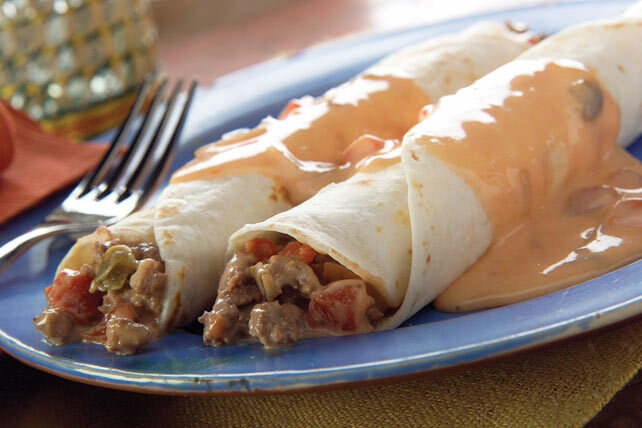 For added colour and flavour, sprinkle enchiladas with 2 Tbsp. chopped fresh cilantro just before serving.